Description of "Let Go Yet Glow"
Mending a broken heart is never easy. There is no quick way to stop your heart from hurting so much. But that should not hold you back from loving again deeply. But how do we get beyond the pain? When the going gets tough, how do the tough get going? Here's a guide to get over your special someone, leaving your blues behind and bringing back the tint of pink in your life. The author writes under a pseudonym - 'KaTHaa'. She has been writing stories and poems since her school days and has had few of her writings published in academic magazines through her schooling years. An Arts Graduate, KaTHaa also holds a Diploma in Hindustani Vocal Light Music from Mumbai University, in French from Alliance Francaise de Mumbai, in Travel & Tourism from IITC Mumbai and IATA / UFTAA, Montreal. She has been in the customer service industry for close to a decade now and considers the psyche of people as a motivational force in her writings. 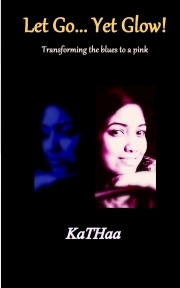 An avid reader, KaTHaa writes mostly out of personal experience. Reviews of "Let Go Yet Glow"